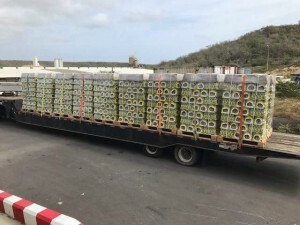 WILLEMSTAD - The Inspectorate of the Ministry of Economic Affairs has destroyed a large quantity of Heineken and Zulia beer yesterday. The beer was from a wholesale distributor located at the Brievengat industrial site. The company had bought these beers for the carnival, but did not sell everything on time. Over 5,000 boxes of beer disappeared in the landfill of Malpais. Also, 8 palettes of San Pelligrino sparkling water went along. Everything took place under police guidance to avoid these products to return to the shelves in a store or on a counter in a snack bar.